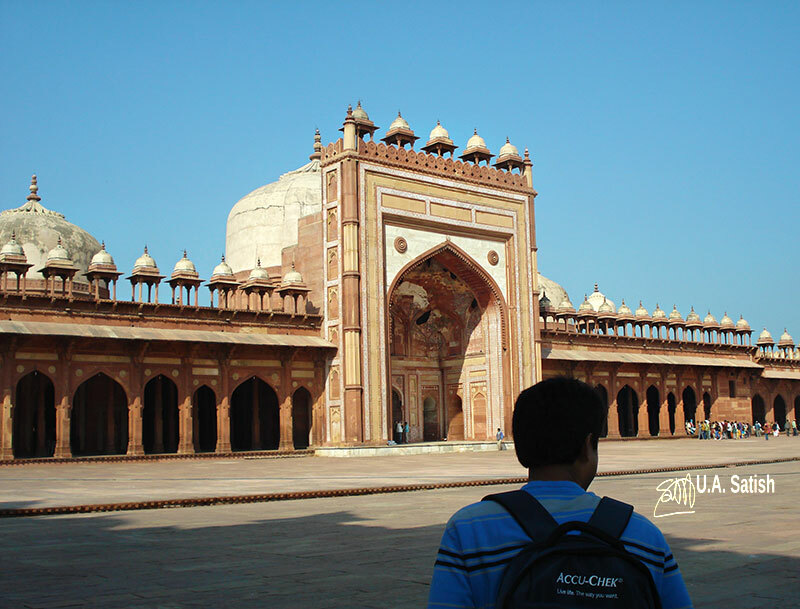 Fatehpur Sikri is 36 kn from Agra. It was the capital of Emperor Akbar in the late sixteenth century. 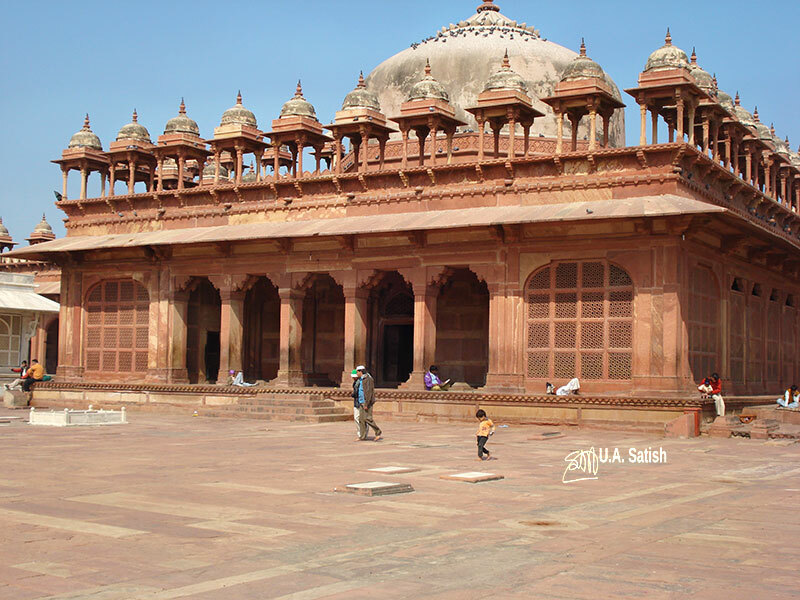 He constructed many palaces, mosques and buildings in Fatehpur Sikri which are his architectural legacy. 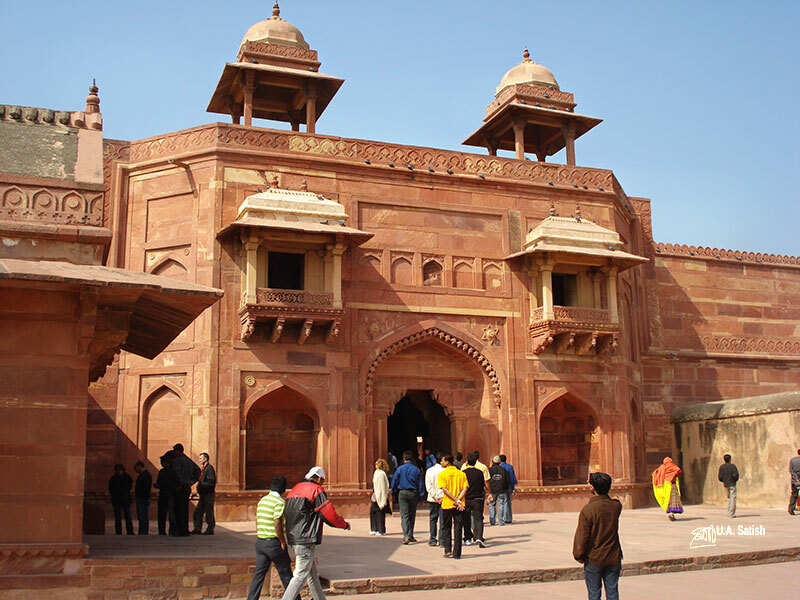 Sikri was the capital of the Mughal Empire from 1571 to 1585. 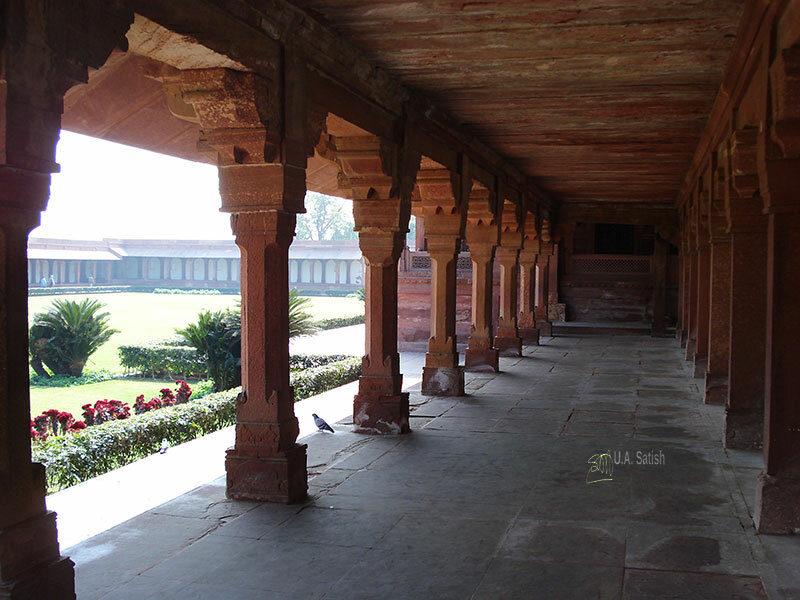 The Muslim saint, Salim Chisti, was residing in Sikri. He had told Emperor Akbar that his wish for a heir will come true. Soon afterwards, Prince Salim was born. He would rule the Mughal Empire as Emperor Jehangir. 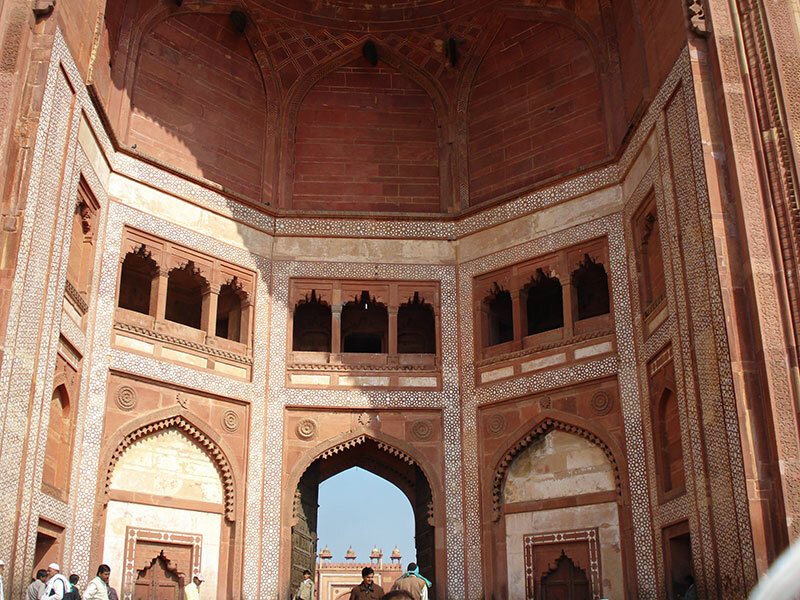 Buland Darwaza is the main gateway to Fathepur Sikri. Akbar erected it as a victory arch after his success in the war over Gujarat. At 54 metres, it is the highest gateway in the world. Red and buff sandstone have been used in the construction. The architectural style has Hindu and Persian influences. The design of Panch Mahal is distinctive. The building has five floors. Size of the floors decrease as we go up. Columns with intricate carvings support all the floors. There are no doors or windows. The Lotus Throne is on top of a massive red sandstone column. Thirty six carved brackets support the throne. The emperor used to sit in the centre and his ministers on the four supporting structures. Crown Prince Salim fell in love with Anarkali. She was a beautiful dancer in Akbar’s court. When Akbar came to know of this, he was furious and ordered that Anarkali be entombed alive. But according to legends, the tomb opened to a secret passage through which she escaped and fled the country. Akbar had three wives- Hindu, Christian and Muslim. Jodha Bai was a Rajput princes. Her palace is the largest in the Imperial harem. The gateway on the eastern side is magnificent. 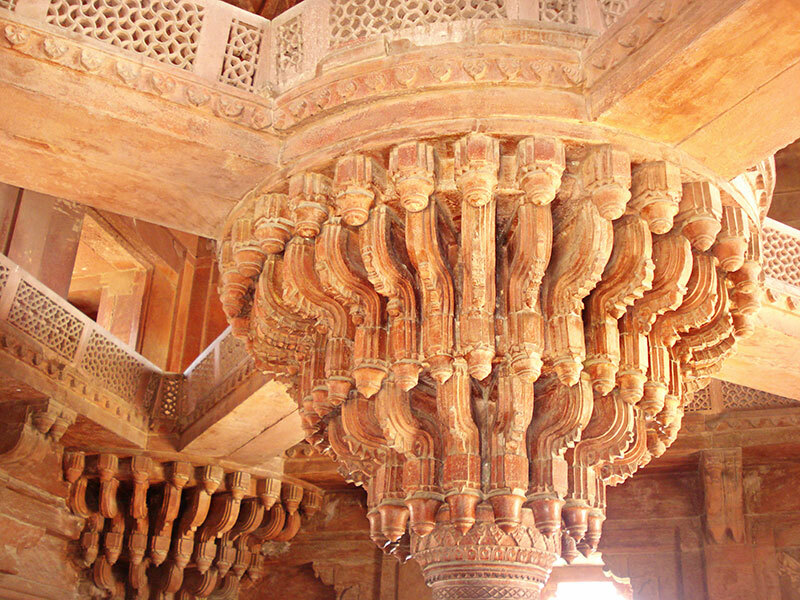 There are a number of Hindu motifs in the palace. 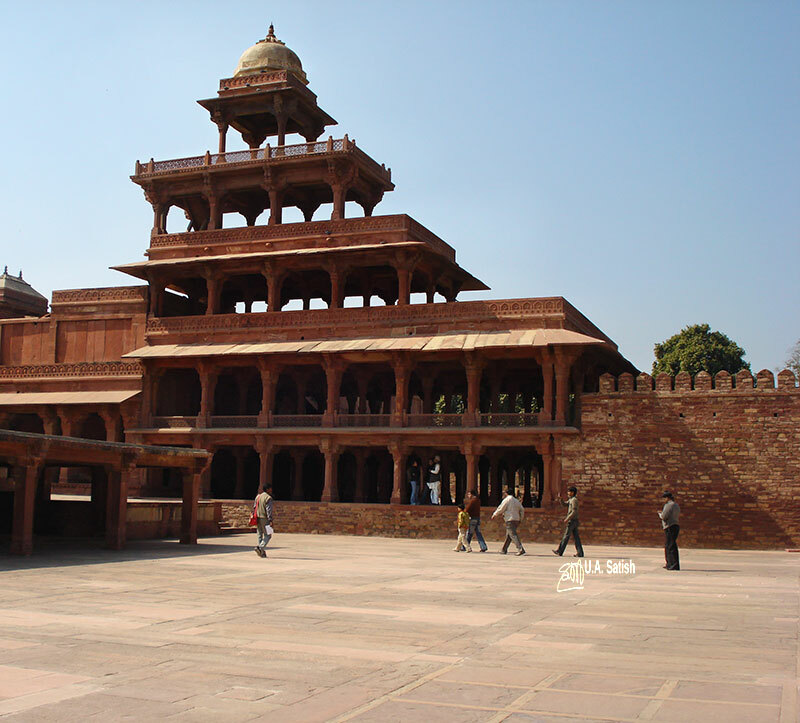 This red sandstone building is the tomb of Islam Khan. It is surmounted by a large dome. Thirty six domed kiosks encircle the dome. Islam Khan was the General of the Mughal Army and grandson of the great Sufi Saint Salim Chisti.